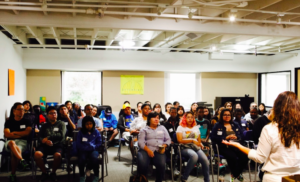 Nearly all DTS students will be the first in their families to attend college, and most are members of immigrant families in which college preparation and the college experience itself feel entirely foreign. Students perform better academically and acclimate more comfortably to their college environment when they have their families’ understanding and support. 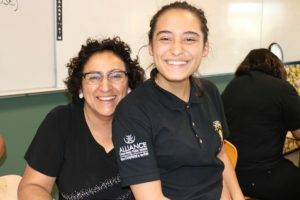 Our staff recognizes the importance of connecting with parents early on so that parents have a level of comfort with the new adults in their student’s life. From day one, we engage parents in their students’ college-going culture in a variety of ways. In so doing, we foster a supportive parent peer network and a dynamic of mentorship between parents of different aged students. From stress-reduction workshops with our Health and Wellness Director, to college information programs and tours, to financial literacy education, to individual conferences with DTS staff members, we address parents’ concerns about their college-bound students and facilitate an essential parent-student connection.